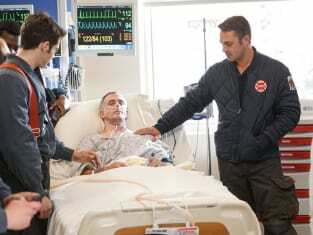 Herrmann's life was on the line throughout the crossover between Chicago Fire and Chicago Med. 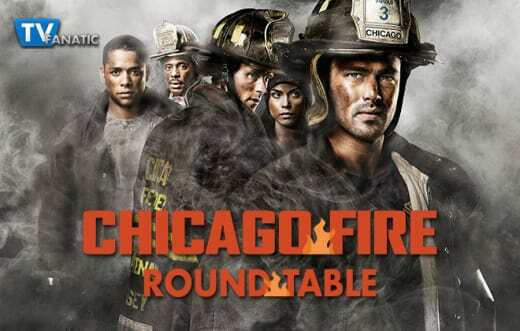 Below, TV Fanatics Elizabeth Harlow and Stacy Glanzman are joined by super fan, Honey, to discuss a big kiss, an even bigger proposal, and our favorite moments from Chicago Fire Season 4 Episode 10. What did you think of Mouch's proposal? Will they actually get married? Honey: Well, I agree with Trudy, a proposal should be the most romantic offer a girl is given, and it should be romantic, not because someone said it was a great idea. Yes, I think they will get married, which will give the chance for more crossovers between them. Elizabeth: Mouch's proposal was characteristically flawed, but those two crazy kids will make it down the aisle for sure. Stacy: He probably should have thought it through a little better, but Platt's counter-proposal made up for it. I agree that they will get married. Were you surprised by Severide and April's kiss? Do these two have a shot? Honey: No, Kelly and April should have a shot at romance. I think this one will work for Kelly. This is not just a one time fling for him; he has loved her for a long time. Elizabeth: I was surprised and more than a little confused. I gave it some thought, and I'm blaming Med's premiere being moved up to fill in for Heartbreaker. 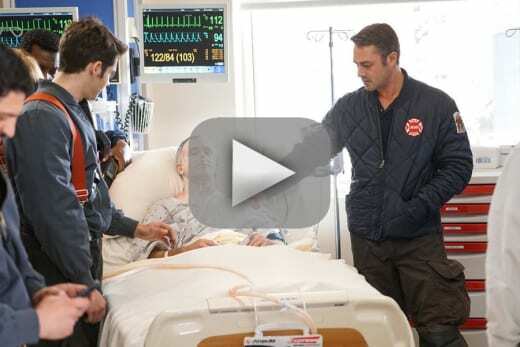 Hopefully April will ground Severide, and he'll make her more interesting. Stacy: Elizabeth, that theory makes sense. It did kind of feel like it came out of nowhere. 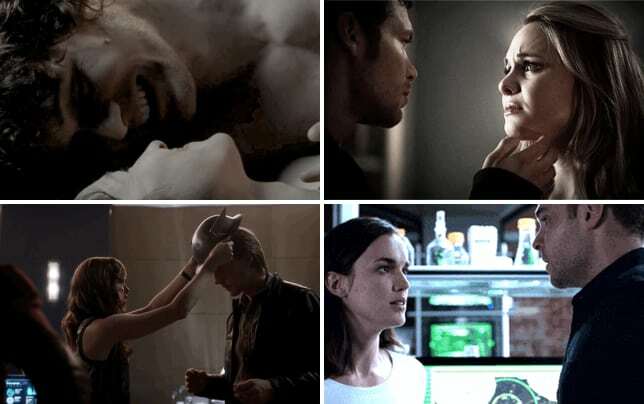 I think that April and Severide could make a good couple if she doesn't let her brother keep getting in the way. 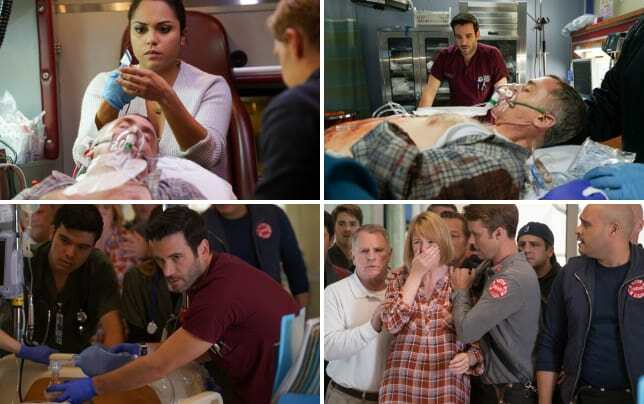 Chicago Fire Photos from "The Beating Heart"
Was Severide out of line for questioning Rhodes' treatment of Herrmann? Honey: No, I don't think so. Kelly was concerned about his friend, and he is a Lieutenant. The whole team was actively supportive of Herrmann, and it was a very scary operation considering all the complications. Elizabeth: I think he was, especially since he's recently been on the other side of lay people questioning professional decisions. And just because one doctor would have made a different call doesn't mean that that would have been the right call. Medicine is as much art as science. Stacy: I think he was out of line as well. His comments were forgivable, considering his emotions were high, but that doesn't mean he was right. As a firefighter, he's very familiar with the need to make a call in a stressful situation and that others may not always agree with him. Are they dragging out the Chili story line? Where do you think it will lead? Honey: Sorta, but there is something hidden about Chili still. Not sure where it will lead, but I hope they get it straightened out. They are good together, other than she is a spontaneous person and that could or could not be a good thing. I think her feelings for Herrmann are like a father figure, maybe. Elizabeth: I'm just saying there better be some real payoff in exchange for how this story is being drawn out. My bet is on mental illness of some kind. Stacy: I suspect this will get worse for her before it gets better. I'm predicting a major screw up that will finally reveal whatever's going on with her. I'm betting on a mental illness, as well. What was your favorite quote/scene? Honey: There were several: when Boden said, "he's the beating heart of 51," to the priest, when Trudy said to Mouch, "sweetheart, A proposal is supposed to be the most romantic moment in a woman's life," when Casey told Dawson, "the truck can go lean this shift, stay here with Cindy," and finally when April said, "that is one tight group." Elizabeth: Firehouse 51 coming together for Herrmann was great, but I actually really liked the scene where Cruz saved Freddie. Even though everything went sideways, Cruz's intentions were always good. I'd have hated to see him lose that part of himself by letting his anger win out. Stacy: I have to go with Platt's proposal to Mouch. They might actually be my favorite couple in the Chicago universe. They're solid. Stacy Glanzman was a staff writer for TV Fanatic. She retired in March, 2019. He's the beating heart of 51. Permalink: He's the beating heart of 51. Hey, you get healed up, okay? I can't do my work right without my mentor around to bully me. Permalink: Hey, you get healed up, okay? I can't do my work right without my mentor around to bully me.